In recent years the Twin Cities has been a top contender for the number one bike city in America by bicycling.com. Why? Sure, we have miles of dedicated bike lanes in the city, in addition to bike trails in nearly every state park. But I think one of the reasons we are a number one bike city is that an estimated 4,000 people in the metro ride their bikes to work – in the winter. For the record, it was zero degrees and snowing when I took this picture on my commute home. Take that, Portland. This is day 364 of Photo 365. 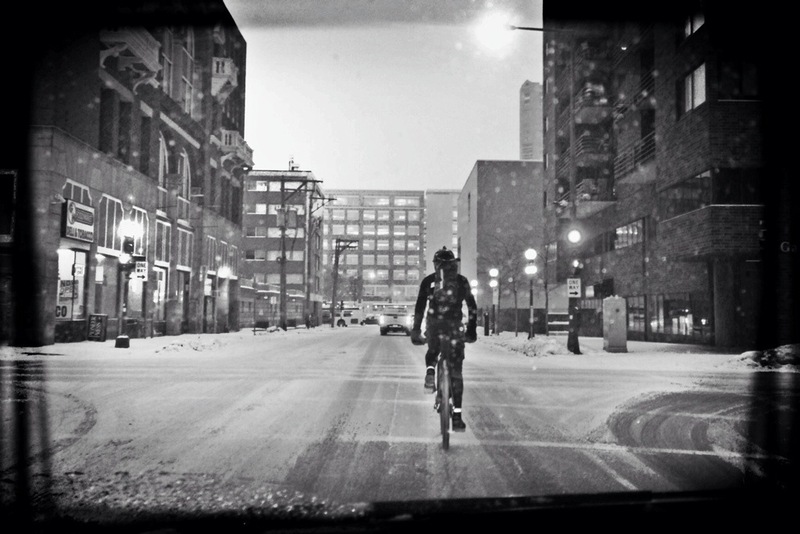 This entry was posted in Photography and tagged biking, Twin Cities. Bookmark the permalink. I am too much of a wimp. I could not ride when it’s this cold. Good thing I live 30 miles out in the country from my work so it’s not an option for me. I hope you are staring a new year of 365 after tomorrow? Me neither! I am in a jacket when it’s 70 degrees so winter biking isn’t even an option in my book. Tomorrow is my last day of Photo 365, and I’m going to enjoy 2014 without homework. Perhaps Photo Month but nothing more. 🙂 And you? I imagine that can get tedious. I only post a few times per month on average so I actually wish I had time to do a little more. But a recipe and photos can take half a day. Anyway, it would still be cool if you did one post each month with a collection of what you saw throughout that month.